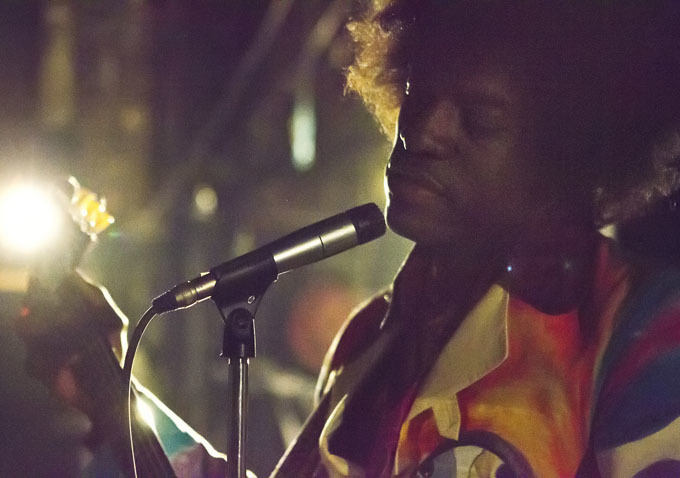 As you’ve no doubt heard, Outkast’s own André 3000 plays Jimi Hendrix in aforthcoming biopic about the legendary singer-songwriter. Today, The Playlist brings us the first official photo of André as Hendrix, above. Entitled All Is By My Side, the film documents Hendrix’s period in England from 1966-1967 as he was gearing up for the release of his debut album. 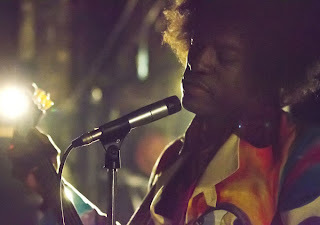 The film will not feature any original music by Hendrix, but instead covers that he performed during this era, including “Sgt. Pepper’s Lonely Hearts Club Band”, “Wild Thing”, “Hound Dog”, Muddy Waters’ “Mannish Boy”, and Elmore James’ “Bleeding Heart”. Because the film focuses on Hendrix’s “pre-fame era,” producers did not feel it was necessary to approach the musician’s estate. ‘This is the story of Jimi being discovered as a backup musician and how he went to London and became Jimi Hendrix,” producer Sean McKittrick recently explained to Rolling Stone. All Is By My Side is set to premiere at the Toronto Film Festival in September and also stars Imogen Poots, Hayley Atwell, André Benjamin, Ruth Negga and Adrian Lester.